The main focus of ownCloud is on sharing documents, calendars and contacts in a secure way which also embraces open standards. There are two main reasons why your group may want to use ownCloud rather than a similar service like Google Docs or Dropbox. The first is that it offers more security for the files that you store, because you store them on your own server and can also encrypt them. The second reason is that by using ownCloud, you are supporting a more decentralised and less monitored internet. If you are uncomfortable about the level of data analysis and surveillance that is involved in signing up for corporate internet services, then ownCloud provides a very useable alternative. 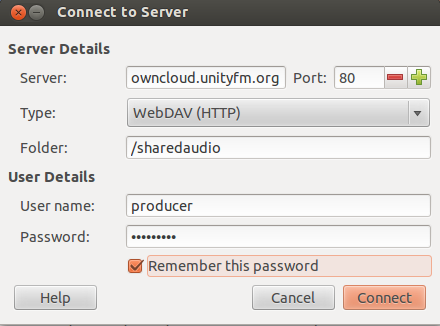 You can connect to online ownCloud folders without having to log in via the internet. 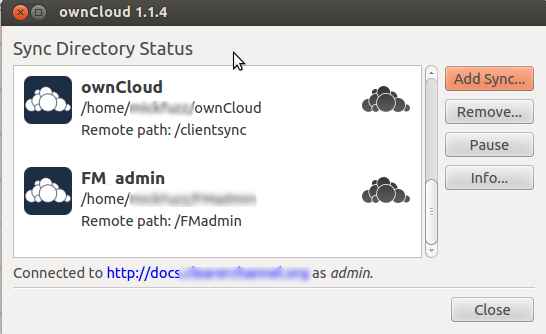 You can do this by downloading the ownCloud client and setting it up to share folders on your computer. This client works in a similar way to the popular Dropbox client. In addition, for most operating systems there is an inbuilt ability to connect to WebDAV servers, through setting up a new web folder in your file manager. The calendars that ownCloud uses support the creation of simple 'tasks', making it suitable for simple project planning. To use Owncloud as a shared repository of contacts, you can export your contacts as vCard (.vcf) files from your email service -- from Thunderbird or Gmail, for example. You can then import these contacts into your ownCloud account. 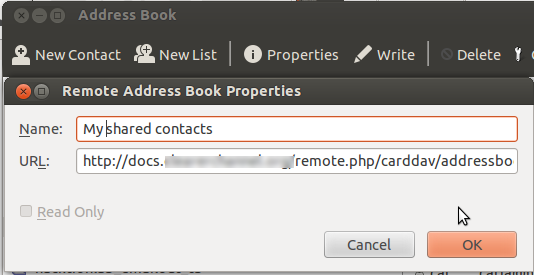 You can also use Thunderbird to manage your shared contacts by setting up a remote address book. While ownCloud works well as a file-sharing platform, it still lags behind in terms of real-time collaborative document editing compared to Google Docs. There is a workaround, however: use Etherpad – another open-source collaborative editing program – to collectively edit the document, and then save it to ownCloud when you're finished. The technology that makes it possible to share files, calendars and contacts is a series of open standards. The standards were conceived to make web-based collaboration easier. These standards include WebDAV, CalDAV and CardDav. What this means for us is that we can set up a space on the internet that is accessible by multiple users, and connect to this via the internet or via shared folders on our computers. CalDAV is an extension of WebDAV for sharing event and task information on calendars, and CardDAV works with contact information stored in vCard format, which is very compatible with email clients and mobile devices. We can see these open standards as alternatives to custom APIs or specialised services and software, which tie you into certain restrictions. If you are using Thunderbird to connect to ownCloud, you will need to install some Add-ons to enable support for CardDAV and CalDAV, namely Lightning and the Inverse SoGo Connector. Note: The latest version of ownCloud has disabled encryption - but it will be rewritten for the next version. If you need encryption, either install a version before v4.5, or install v5 onwards. Also, encryption works only for files -- contacts and events are not encrypted.